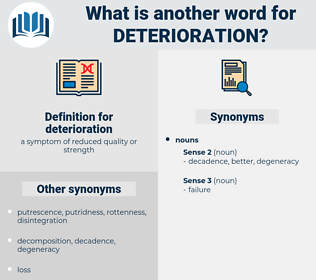 What is another word for deterioration? aggravation, exacerbation, degeneration, degradation, deteriorating, worsening. 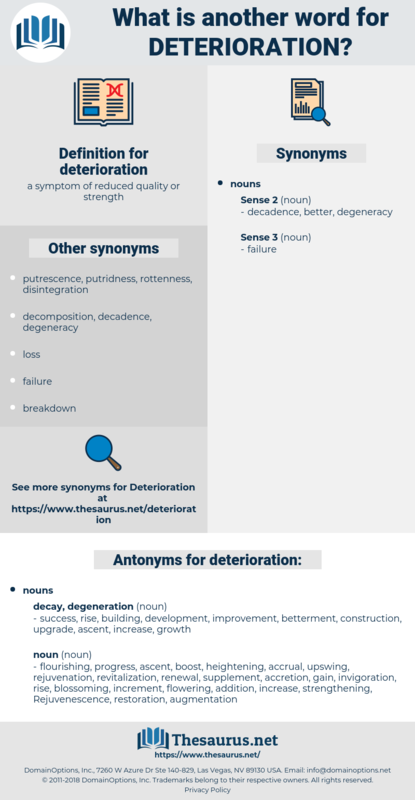 disintegration, spoilage, retrogression, depletion, disrepair, regression, weakening, destruction, defacement, disruption, depreciation, downside, deepening, degrading, intensification, collapse, recession, slowdown, Weathering, downgrade, attrition, slump, retreat, rust-out, distortion, retraction, demise, backsliding, deprivation, loss, disturbance, increase, decomposition, demotion, widening, regress, pollution, undermining, tightening, tampering, downfall, dilution, detriment, depression, unravelling, lowering, demolition, break-up, disorder, abrasion, adulteration, weakness. erosion, downturn, escalation, downgrading, impoverishment, alteration, situation, fall, harm. success, rise, building, development, improvement, betterment, construction, upgrade, ascent, increase, growth. strengthening, gain, increment, accrual, revitalization, supplement, boost, flowering, flourishing, heightening, rejuvenation, progress, renewal, Rejuvenescence, addendum, raise, invigoration, augmentation, accretion, upswing, blossoming, restoration, addition. And, on the other side, as certainly, there are progressive deterioration and approximation to disintegration and ruin. It is such unions, and not those inspired by the wholesome instincts of wholesome lovers, which lead, if not to the abstract " deterioration of the race," at all events in numberless cases to the abiding unhappiness of persons who choose a mate without realizing how that mate is likely to develop, nor what sort of children may probably be expected from the union. duration, dryden, dardan, dardanian, dehydration, detrition, doriden, dirty money. dilapidation, devastation, desolation, wear, decrepitude, corrosion.